I posted about my game here a looong time ago, so I thought you folks might appreciate this post-mortem I wrote for it. Note: Lemmasoft doesn't like wide images, hence why images are shown as hyperlinks. It's been a year since I released my first game, MMM, so it's time I did a proper post-mortem of it. I think there are definitely some useful insights to be gleaned from it. MMM: Murder Most Misfortune was released May 1st 2017 for Windows, Mac & Linux on both Steam and Itch.io. It is available in English, Spanish and Italian. MMM is a short murder mystery visual novel game, inspired by British murder mysteries by Agatha Christie (such as Poirot) and the Ace Attorney series. In it you play as Miss Fortune, a widow nine-times over. Miss Fortune is invited to a secluded mansion for a dinner party where a murder occurs, and she is framed. The player must then talk to the other guests, and explore the mansion to figure out what happened before the police arrive and come to the wrong conclusions. The game had multiple endings, where you could frame any of the characters with murder if you had enough evidence. It took between 1.5-3 hrs of play-time depending on how many endings you do. Each line of dialogue is fully-voiced, and you are able scroll through rooms in a point-and-click style to find items of interest. We also had an optional timed mode, where the player had a limited amount of real-time to explore the mansion before being forced to make an accusation before the police arrived. MMM was made mostly between four people: I directed, programmed, my brother wrote the excellent script, and a friend made all of the art, and another friend did most of the audio engineering. It took ~2 years of part-time work to finish it. 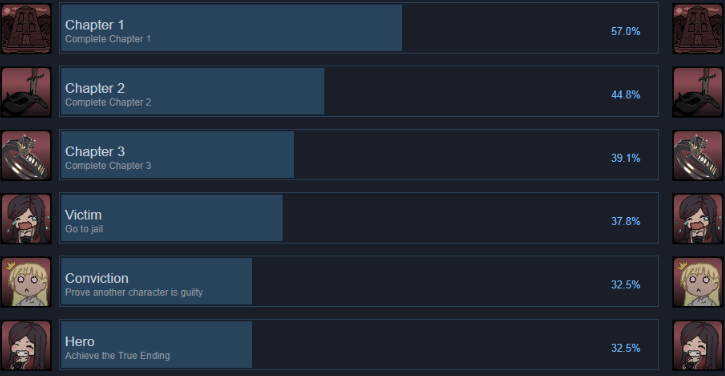 Critical Reception: Although not having too many Steam reviews, the vast majority are positive, with 25/26 of them being positive. Many reviews mention the quality of the voice acting, and the writing itself. Unfortunately we did not get any large media outlets of note to cover or review the game (only a few extremely small sites). We did distribute keys through key-mailer, and had a few small youtubers play through the game. Here's a picture of the steam achievements 6 months after launch, which can be used as an estimate to how many people actually played the game, and how far they got. 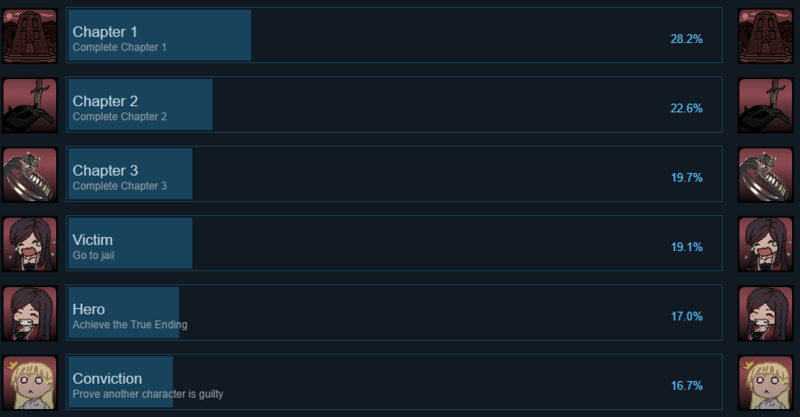 57% of people had finished the first chapter (~20 minutes of gameplay), and ~37% had gotten at least one of the endings. When sales slowed to a crawl, we recently put the game on a bundle. This understandably drastically lowered the achievement rates. Overall, the game had a median play-time of 2.5 hours. Sales: Although I can't be too specific about Steam sales numbers, overall they have been low (~1k sales). Sales followed the usual pattern of having the most purchases in the launch week, having almost no 'organic' purchases when no sales are on, and substantial spikes in purchases during sales. As can be seen from the regional sales chart below, the majority came from the U.S., with Germany, U.K., Canada, China and South Korea following belatedly. Japan had fairly low sales. It is difficult to surmise how well it would have done if there had been a Japanese localization (which would've been very expensive), but I have heard that western visual novels are not so popular there. Surprisingly, only 38% of sales came from primarily English-speaking countries (U.S., U.K., Canada). A quarter of our sales came from 'other' countries. This is significant, and it is possible the Spanish and Italian localisations helped with sales from these 'other' countries. Poor marketing. None of the team had experience marketing, nor do any them of like social media. The only marketing done was some forum posts and some Facebook ads. A larger emphasis needs to be placed on marketing as game market becomes more and more crowded each year. Target audience mismatch. Do people who like well-thought out murder mysteries that look like anime visual novels? The anime aesthetic might have been a turn-off for many, thinking this is just a generic anime dating-sim visual novel. The visual novel crowd also might not be into well-written serious mysteries, especially with a timed aspect. Many users want to just relax and read a slice of life story, not an in-depth mystery. There are so many games. 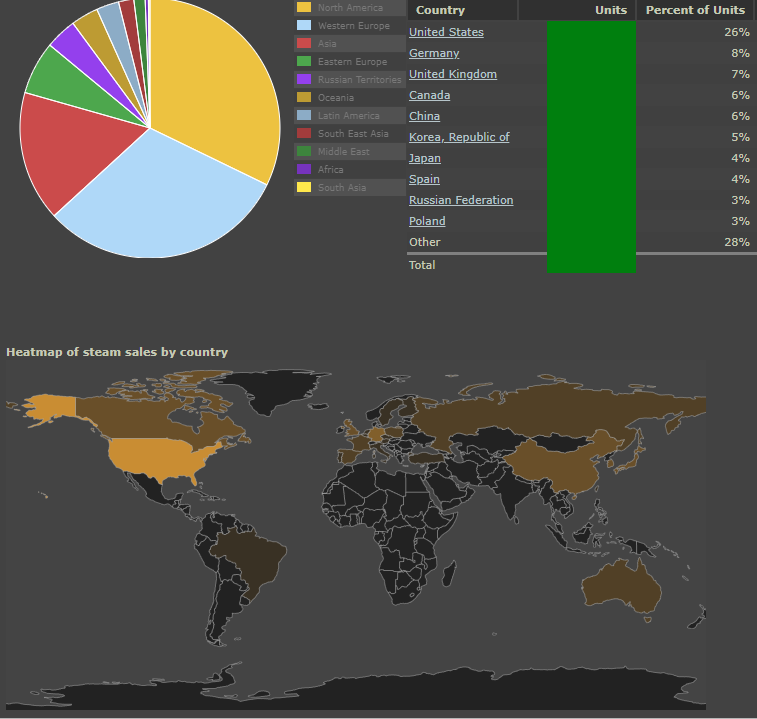 Steam has become bloated, with ~15 new games being released each day (at time of our release). It’s increasingly hard to get noticed as you vie for attention not only with other indie games, but AAA games as well. We released close to the end of Steam Greenlight's lifespan, but it's hard to say if that had any effect on sales. Itch.io: The game is available on Itch.io as pay what you want (which we think is the future of digital purchasing). We’ve had close to 2.5 times the downloads compared to Steam, but only 16 purchases. We don’t believe this affected the sales on Steam, as the audience on Itch.io are quite distinct than the Steam audience, but we can’t confirm this. Our goal is to make people happy by playing our games, so we’re not disappointed when people who would otherwise NOT buy our game have a chance to try our game. It's easy to get wishlist adds, but even with sales it's difficult to convert those wishlist adds to purchases. North America and Western Europe accounted for 64% of sales. High, but not as high as we anticipated. Although difficult to ascertain exact numbers of people who bought the game it was in Spanish or Italian, these translations were probably not worth the cost and effort of producing them. Sales from Italy is only 20, while Spanish sales are more difficult to ascertain since many countries speak Spanish. It could be argued that the Spanish translation is worthwhile, while the Italian one isn’t. Why did we choose Spanish and Italian? Well, the Spanish one was due to a friend of a friend being a native Spanish speaker. The Italian one was offered to us online for a very low price. Everybody plays on Windows. Linux activation's account for 7% of sales, and mac for 2.5% of sales. We made the game using Unity, so luckily it wasn't much effort to export Linux and Mac versions. I would have been very disappointed if it had been much work making mac versions. Itch.io doesn't make money. It has some great ideas (pay what you want, great community tools), but barely pays for a few meals. Itch users appear to expect mostly free games. More marketing. Marketing needs to be done throughout development, not just at the end. Although I did the occasional screenshot post or forum post in visual novel dev forums, the overall marketing effort was extremely lacking. This is difficult, as I personally dislike social media. Finding someone who can do this, or finding a more entertaining way to do marketing will be important in future endeavours. Art is all-important. Although a game is made of many parts, the only way to get people to try your game is through incredible visuals and screenshots. We felt our art was decent, but it perhaps could have been improved. Several reviews mentioned not liking the art style, which could be due to the different art style from anime-looking visual novels. It was also sometimes difficult to pick out objects from the background when exploring rooms. Voice-acting is expensive. We had promised our voice actors a percentage of the profits (up to a limit), but unfortunately with our initial sales these percentages amounted to very little. I felt bad about the work they put in, so I decided to pay them the maximum amount that was promised out-of-pocket. This maximum amount was still below what is considered industry standards voice-acting fees. Only after a year have we recouped that expense. Although the voice-acting was of excellent quality and definitely improved the game, I would be very hesitant in including it in the future. Profit margins are already slim, and voice-acting can be incredibly expensive. It would not have been possible to make the game any longer and still have each line be fully-voiced. Everything takes longer than you think. As mentioned earlier, it took us ~2 years of part-time work to make a 3 hours game. We thought that making a short high-quality story-based game would be fairly easy. Turns out, nope. The voice-acting, and different endings took significant amounts of time. I now have new respect for TellTale games, and now know how much effort it takes when making branching story-lines. Making games with branching stories is a big risk, since it takes a lot of effort, and you're making content that many users won't see. Only after a year have we finally covered all outside expenses (not hours spent writing the script or coding), making the game a financial failure. Overall though, we're proud of what we made, and had a good time making it. Despite the financial aspect, we've learned much from making this game, and are considering a sequel (involving Egypt, a mummy, and of course, murder). Last edited by DeeCeptor on Thu May 03, 2018 12:41 am, edited 1 time in total. Thank you for the time you take to put all these insights together! I'm sure many of us appreciate it. I actually agree that Pay-What-You-Want is the future of digital softwares. However, Patreon model seems to work better than itch io. They encourage creators to keep releasing works for free, but it is done out of the website, because the website itself is money-oriented from the get go. So players can choose to play the game once they're out or keep supporting the devs regularly. The website isn't perfect, especially how they handle payment, but when we talk about pwyw model, it's as good as it gets for now. Anyway, congratulations for the anniversary of your released game, good luck in your future projects! Hey, this is a really cool post-mortum and I think it would be awesome if more developers did this with their games I think it'd be really beneficial to the community! I think advertising being king has been the most repeated refrain from people discussing how to make your game sell better. Still, I think ~1k downloads is an achievement you should be at least a little proud of and not just disappointed in! Thank you for sharing! [*]while sales from Spain and Brazil total 50 (and there are many other Spanish speaking countries). It could be argued that the Spanish translation is worthwhile, while the Italian one isn’t. You're looking at a Portuguese (and Brazilian Portuguese at that, as it's distinct enough it's uncomfortable for most people from Brazil to consume media in Portugal Portuguese and vice versa) translation, not a Spanish one for Brazil. Please make sure when considering translations, you know what languages you actually need. Pstt, do you need a video? I'm also a fan of the patreon model. Very useful for the continuous delivery of things like videos or art. Do you know of any example games being made through patreon? Yeah it's a useful exercise to step back analyze your lovingly crafted game at a distance. We're still proud of what we made, and happy that most people appeared to enjoy the game. Unfortunately it means going full-time game development isn't feasible for the foreseeable future. I was really intrigued by this and played the demo during development, but didn't really get hooked on it. Part of it was definitely the lack of advertising, some of it was the characters all having clothes from mismatched time periods, and I think the most major problem was that, while I love mystery and point and click gameplay, the characters and plot just didn't hook me. As harsh as it may sound on the surface, I didn't really like or connect with any of the characters, particularly not the MC, which generally doesn't bode very well for a VN. There was definitely a self-aware humour about Miss Fortune and I liked how clever and crafty she was, but it ultimately was not enough to interest me in pursuing the game further. This is a completely subjective aspect, but as much as I love gothic settings (and their intelligent parodies) I kept on feeling throughout my playthrough that the game took itself too seriously or was being distractingly clever with the characters and setting. I just couldn't really get engrossed inside the game, no matter how much I wanted to since it is totally my favourite genres. I hope my rambling thoughts can be of some use. Since one of the concerns you mentioned was that VN players might not like mystery, I wanted to chime in as a VN and mystery lover. And yes, Agatha Christie is the correct primary source to base your mysteries on so far as I am concerned. I think I might be through 3/4 of her books now. Anyways, I really admire and appreciate you making this post. I found it very enlightening and interesting to learn about, so thank you for your openness. ...I am in full favour of mummy and Egypt mystery done right, yes please. Please. You can call me Fae! I offer 110% free proofreading, editing and ideabouncing for select games. You can find out more in my thread. You can use filter to sort visual novel, and those who made it to top 1000 are all NSFW developers. On a more humble level, though, I see a dozen others who sit comfortably above the 100 patrons per month, but it depends on your target and how long term you want to support the projects through Patreon, I suppose. I haven't analyzed more due to limited amount of successful Patreon, though. Oh, I forgot! I believe that a member of this forum is developing a game using patreon. It's not a VN, more of a Harvest Moon-esque game. Estherfunworld, I believe. However she is an extremely skilled artist who also offers a lot of NSFW sexual content, so it probably wouldn't be a fair comparison for your company to look at. Thank you for the detailed (and fascinating) post-mortem! I'm going to echo that >1,000 downloads is something to be proud of and I appreciate all of your insights! Thanks for trying the game! Yes, the main character has been a bit polarizing; she is definitely not a good person. Your thoughts also perhaps suggest that something dramatic needs to happen earlier in the game to hook you in? In show business they always open with their 2nd best act to hook people right from the get go. I'll have to think on that more in the future. Thanks for searching for me (haha, yes I could have filtered too). It appears that NSFW is pretty popular. I'll have definitely consider patreon in the future, It's certainly easier to generate buzz (and patrons) the more famous you already are. Thank! And yes, we're proud of our game. Just wish it paid our a bills a bit better. Yeah, I can't blame you there. But perhaps the next, with more marketing and a bit of buzz from the first! Yes, from what I've seen, despite what I would expect, it seems most players of games are turned off by villainous, mean or generally bad MCs. Which I suppose makes sense since most people probably aim to be good in real life and so they project that onto their in-game self. I think that evil routes are still a good idea, even if they are mostly only explored by players after numerous playthroughs. As for not getting hooked to the story, maybe having an exciting event could have fixed the problem, but I honestly thought the reveal of the murder happened at a pretty good time to create tension. I think, for me in this case, it had more to do with the setting and characters. While there's definitely plenty of exceptions, notably in very interactive games, setting and characters are probably what ultimately sells me on a game the most, personally. I felt like neither of those were very present in the demo for MMM. The world it takes place in didn't pop out to me as being particularly well-built, complex or intriguing with the mismatched clothing and behaviour of the different characters; it just didn't come across as...properly grounded, somehow? I didn't believe the world like I do in other more loved fiction media I've consumed. That combined with not having very unique or attention-grabbing characters without much for chemistry from what I could see ended up being the demise of MMM, despite the very appealing gameplay for me. I really hope that isn't too brutal or honest. Really hope! Just trying to be as helpful as possible with figuring out what it is that didn't entice me. I'm far from the typical player statistically, but...hopefully this helps even the tiniest bit? Yes, the world is a bit strange (and not described too well during the game). Thanks for your feedback! Thanks for this, it was a very interesting read! It does make me consider keeping costs low on projects where possible. Marketing is a bit of a challenge for me for a variety of reasons, most my games aren't really directed at people on this board, so there is not much point for me to post on the work in progress section. I have some ideas, but I will need more. Hopefully I will find a way to make it work. This was a very interesting read. Although I am not going to try to make money with my novel yet, I am interested most of all in knowing which tools are most useful for promoting a visual novel. I haven't been searching a lot yet for this, so I was just wondering if someone knows about some online guide about marketing visual novels? Working on a Visual Novel since May 2017.